The Bolognese is one of the Old World Bichon types of companion dogs. 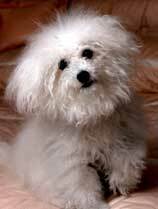 The breed was referred to as the Italian Bichon of Bologna, from which the name "Bolognese" was adopted. They are generally small white Toy dogs with square, compact outline and distinctive coat. They are very intelligent and have great charm, making them excellent companions. The Bolognese was recognized by the United Kennel Club on January 1, 1995.